How does the average American feel about the abortion restrictions being busily erected in states around the country, 80 of which limited reproductive rights in the last six months alone? It's complicated. The most recent Gallup poll is pretty consistent with previous findings: Parental consent laws are popular (71 percent). 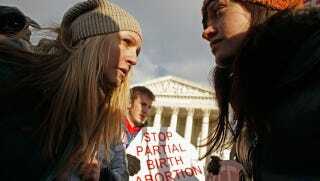 64 percent oppose "partial birth abortion," a rare procedure that has been banned since 2003. Defunding health clinics that happen to provide abortions, most visibly Planned Parenthood, remains pretty unpopular, with 57 percent opposing it. Other issues were more evenly split: 50 percent support forced ultrasound viewings for women seeking abortions, 46 percent oppose. A similar split can be seen on conscience clauses allowing health providers to opt out of abortion-related services, though with less support (46 percent). Also, gender consistently has no correlation in polls with one's views on abortion rights — but party affiliation does. That said, Democrats aren't consistently against the state-wide restrictions: half of them said they supported making women look at ultrasounds. One caveat here is that these numbers are a little bit like nationwide polls for president: Ultimately, it comes down to the compositions of individual states. But they also show where the center is holding on these issues, which in turn informs the national agenda. The most-supported abortion restriction, with 87 percent in favor, is for "informed consent" laws, but all is not what it seems. It sounds very reasonable to require doctors "to inform patients about certain possible risks of abortion before providing the procedure," as Gallup put it. Until you find out that what that means in practice and how much it exceeds how any other surgical procedure would be described. According to Guttmacher, six states with such laws "that include information on breast cancer inaccurately assert a link between abortion and an increased risk of breast cancer, and "7 of the 20 states that include information on possible psychological responses to abortion describe only negative emotional responses." In South Dakota, a vanguard state when it comes to this stuff, doctors are forced to tell their patients, falsely, of an "increased risk of suicide ideation and suicide." Oh, and while they're at it, doctors have to tell women, "That the pregnant woman has an existing relationship with that unborn human being and that the relationship enjoys protection under the United States Constitution and under the laws of South Dakota." How many of Gallup's 87 percent would still be on board for that?